Happy first day of April and official month of spring, everyone! I know I had this post planned for yesterday, but it had to wait until today because I spent many an hour compiling events and writing up the April Food Calendar and all of its brothers and sisters last night! 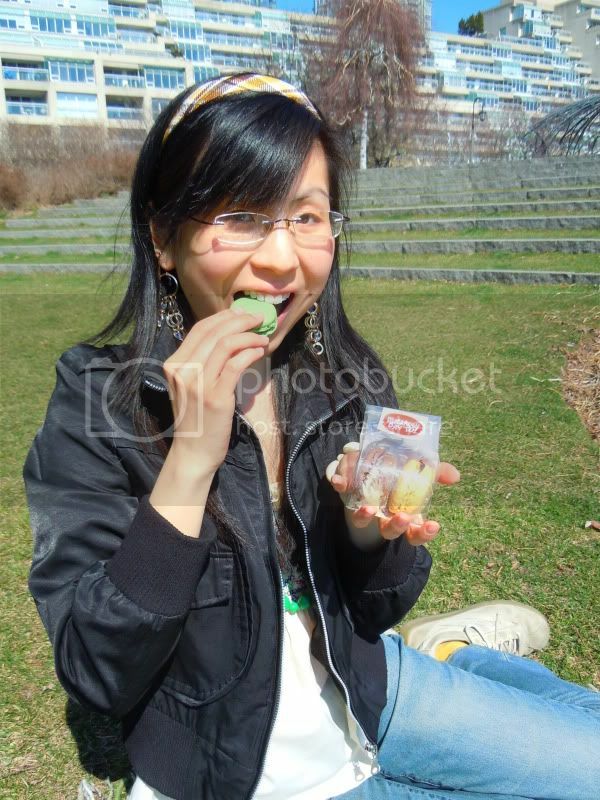 That, and enjoying a fun spring day out with my mum in the city where we frollicked around eating delicious food. Yesterday marked the last day of free YRT/VIVA bus service in my area and there was no way I was going to let the day come and go without taking advantage of the last day I would most likely ever experience free bus service during the course of my life. The two months of free bus riding in York Region (to make up for the 3-month transit strike) was wonderful and I am so sad that it’s over. I can’t even begin to tell you how much the free service in my area has helped me, both financially and socially. And by socially, I mean with the blog. So I am not only bidding farewell to the month of March, but also to the days of not having to sticking bus tickets into machines and buses. Sigh. Part II of Friday’s Flour Studio cupcake post is here though and it’s time to look forward, toss the confetti, and introduce the first official Oreo post in the brand spankin’ new Oreo Anniversary Series! Since my celebratory post marking Oreo’s 100th birthday during the first week of March, I’ve been busily researching Oreo desserts in the city, compiling ideas for this new series, and coming up with some fun Oreo related recipes. I have a delicious new cookie recipe to share with all of you later on this week and plenty of Oreo delights I plan on dishing out throughout the rest of the year including different styles of Oreo cupcakes, Oreo sundaes, cheesecakes, crepes, and so much more. It’s going to be so much fun seeing how different bakeries and dessert shops use Oreos in some of their products and how they interpret the iconic Oreo in their usage. 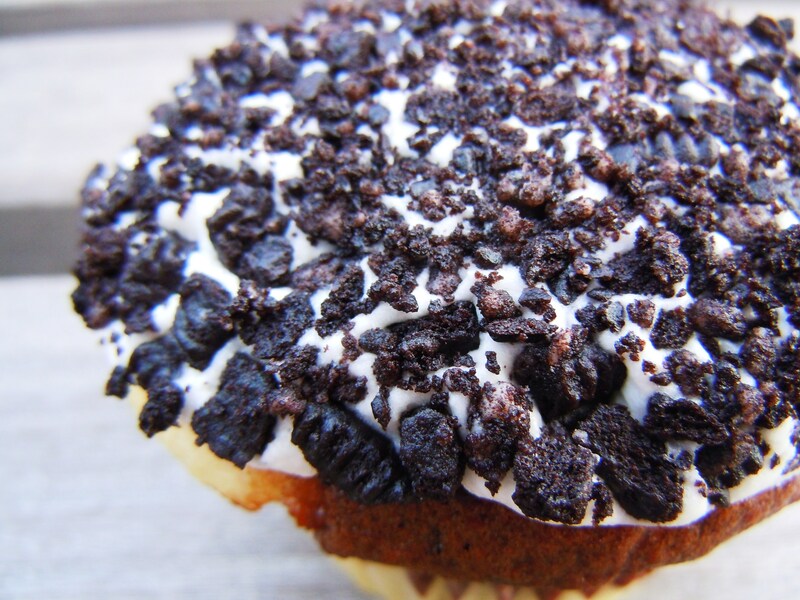 First up: the Oreo cupcake from Flour Studio! I know it may seem like an Oreo is just an Oreo when it comes to cupcakes, but it’s fascinating to see how and where the Oreo is used. Is it used in the cake? In the frosting? In both? How about crushing, crumbling, or using the cookie as a whole? 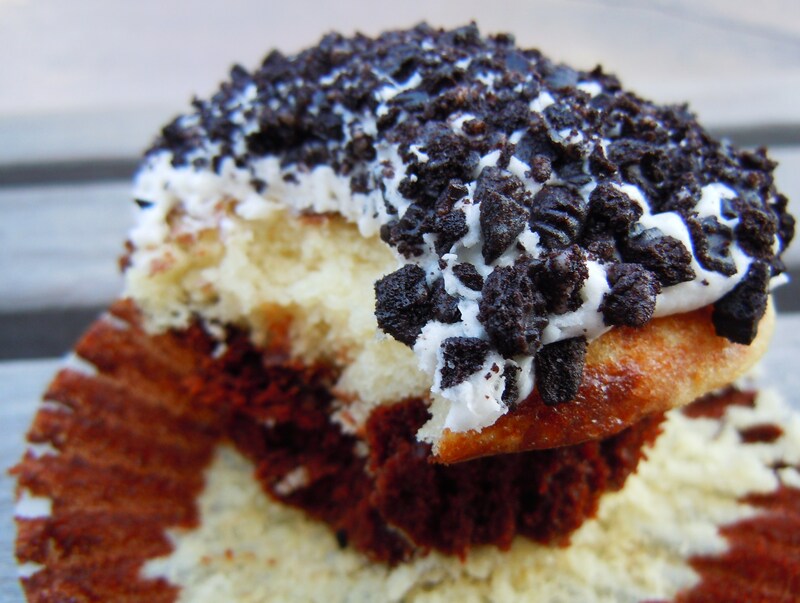 There are so many ways to go about it and Flour Studio’s Oreo cupcake is especially fabulous and delicious. And lucky for us, it’s a permanent everyday menu item! The Oreo cupcake falls under the “Signature” flavour price point at $3 (cupcakes such as the vanilla and chocolate squared are priced at $2.50 in the “Originals” category) and I’m telling you, if it didn’t live up to its $3 price point, I wouldn’t be posting it here. But it does because I am. 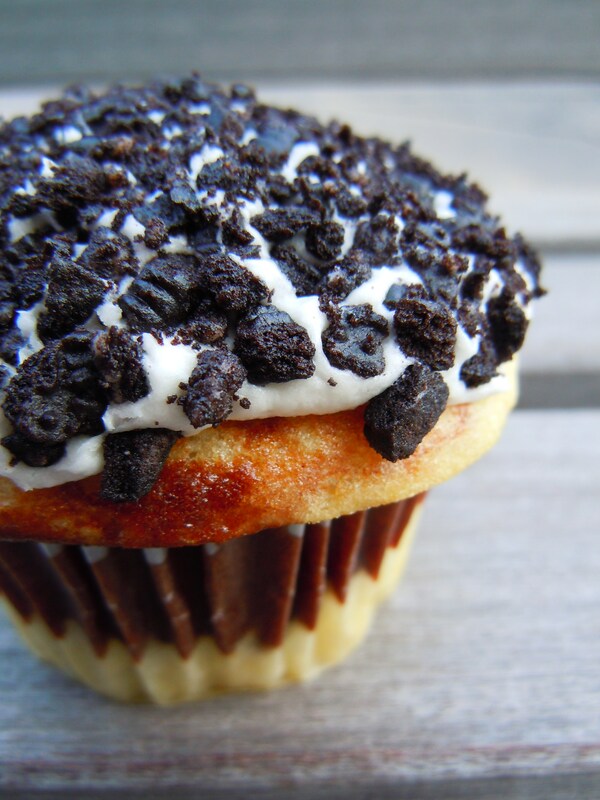 This Oreo cupcake is delicious in so many ways. 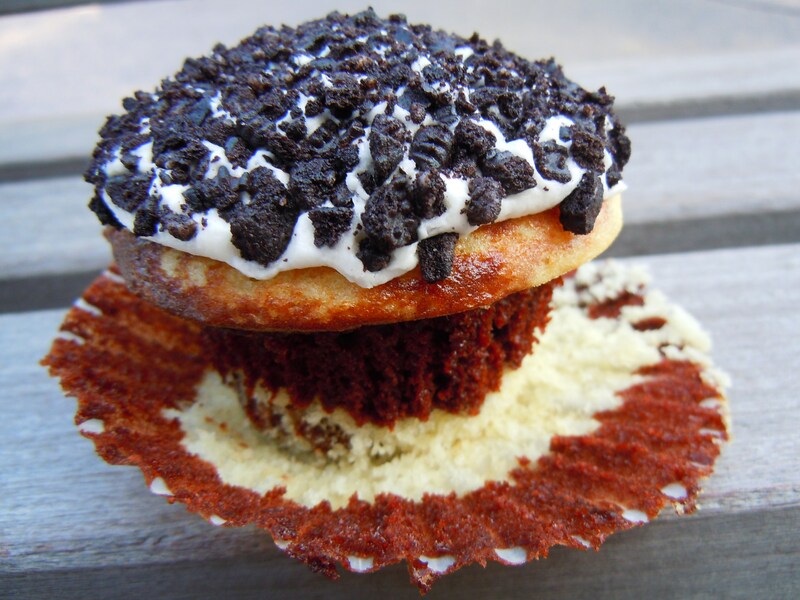 For one, the entire tops of the cupcakes are frosted in a layer of vanilla Oreo cream frosting and then dunked into a pool of crushed Oreo cookies. 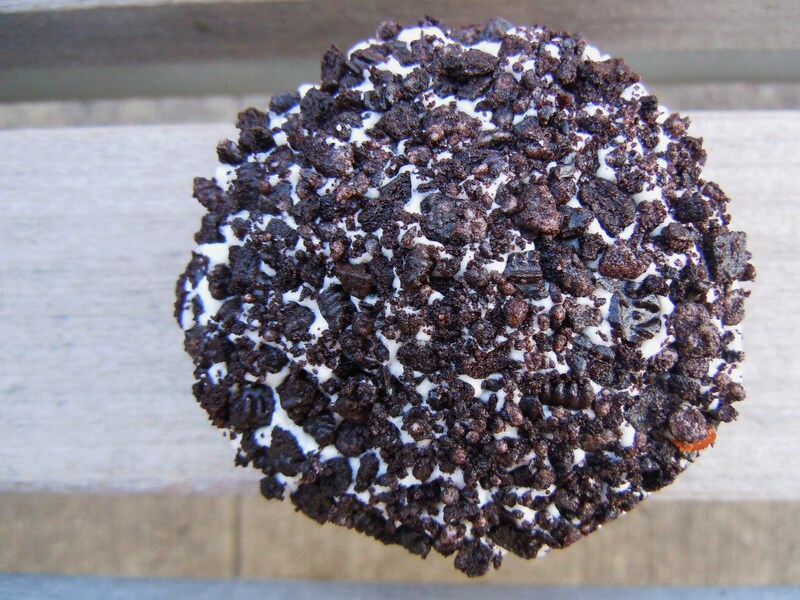 Not chunky pieces, not crumbs – we’re talking about a mosaic of crushed Oreo goodness on a frosted cupcake top! It is heavenly delightful. So delightful that when I offered my boyfriend a bite, he ran back into Flour Studio to purchase one himself. We probably looked like cupcake idiots running back and forth, toting our cupcake baggies, crouching down to take photos (just me, not him) with people and cars passing by, inhaling our cupcakes, and devouring the remaining crumbs from our fingers in the middle of the sidewalk. But I don’t care. 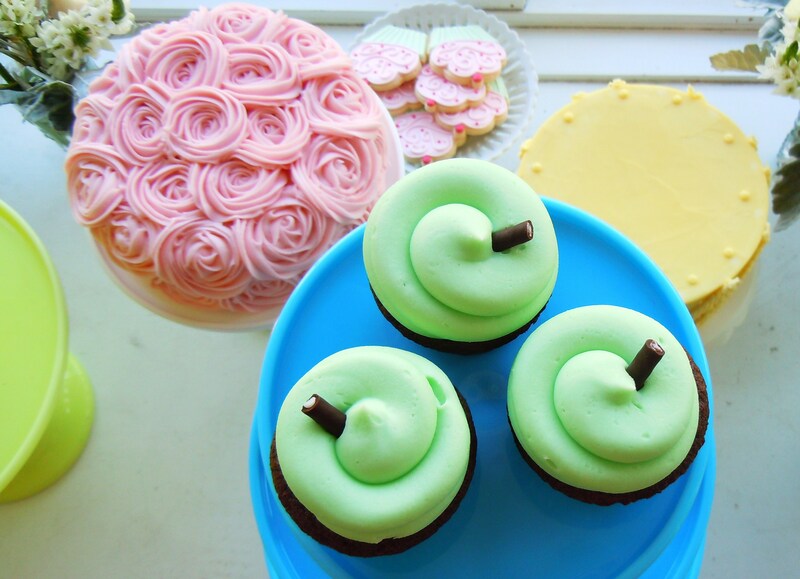 Because yummy cupcakes make the world go round. In addition to the wonderful Oreo cupcake top, the cake itself is top-notch: it’s marble cake! The cake is a soft, incredibly moist marble of vanilla and chocolate and it is one of the lightest, airiest cupcake bases you will ever sink your sweet teeth in. The vanilla, fudgy cocoa cake melts in your mouth and it is light as air. The cake complements the Oreo top so well because it doesn’t overshadow or overwhelm the Oreo. The Oreo top is allowed to shine and the textures and flavours balance each other out. Oreo cookies already come with their own sweetness so to make the cake extra sweet would be overkill. They don’t compete with one another and that’s a good thing because you get to enjoy the Oreo aspect for what it is. 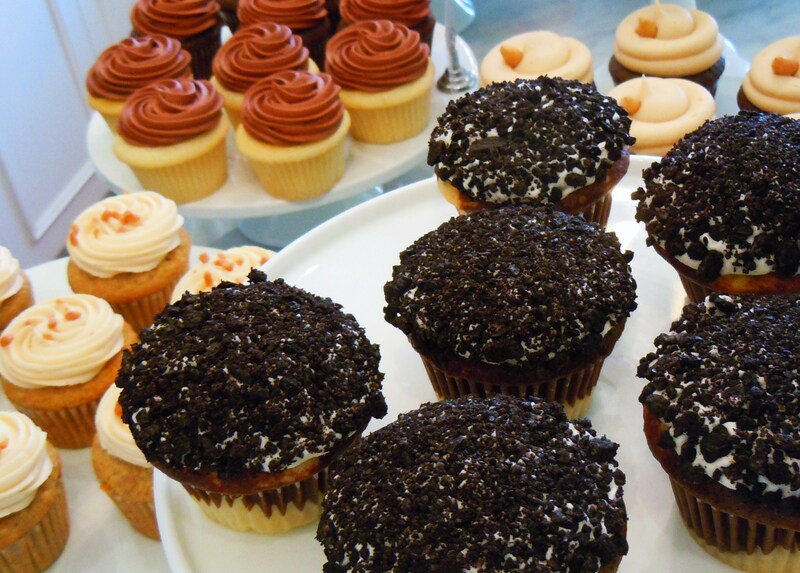 You get the whole cupcake package: a sweet thin layer of creamy frosting that tastes exactly like the middle of an Oreo, the crumbly, crunchy cookie bits, and softness of the cake. I also really appreciated how Flour Studio carefully thought about the Oreo flavours and aesthetic of it. 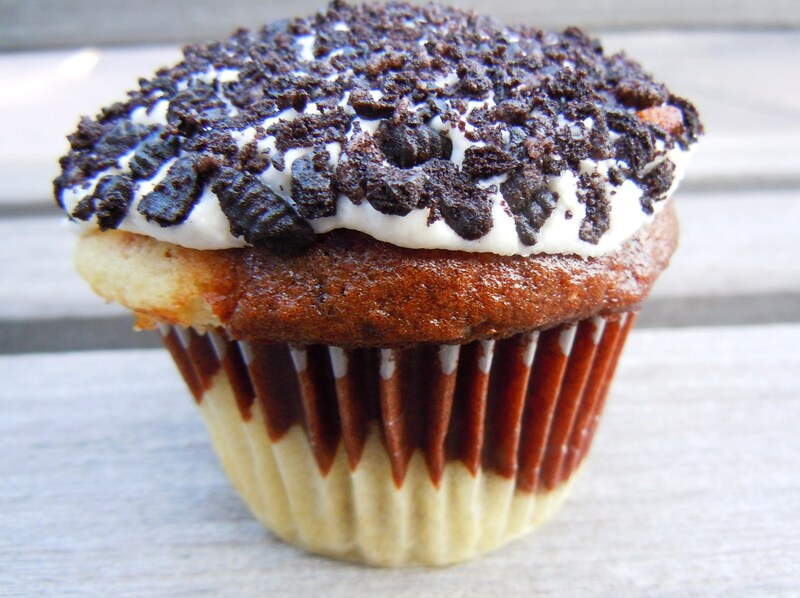 Vanilla and chocolate are what Oreos are all about it so to make the cupcake a marble one makes so much sense, not to mention how pretty it makes the cupcake! There aren’t a lot of marble cupcakes in the cupcake shops in the city so this was a really nice treat. I haven’t made my official post and launch yet, but I’m planning on holding an “Oreo birthday party” of sorts on the blog throughout the year to celebrate Oreo’s milestone 100th birthday and this involves all of YOU! In case you didn’t catch it in my Oreo’s birthday post, I’ll be having guest contributors and posts by fellow foodies and bloggers send in their Oreo dessert recipes and photos to be posted on Ate by Ate in honour of the occasion! If you’re interested in contributing, just send me an e-mail at perky_peach [AT] hotmail [DOT] com. I’ll have a special banner/button for everyone to post on their blog and it’ll be such a fun way for us to get to know one another and to meet fellow food bloggers! Happy Oreo-ing! Flour Studio is located at 883 Eglinton Ave. West, about a block west of Bathurst St. They are closed on Mondays and Tuesdays (appointments are exceptional), and are open from 10am-6pm Wednesday-Saturday and from 1oam-3pm on Sundays. 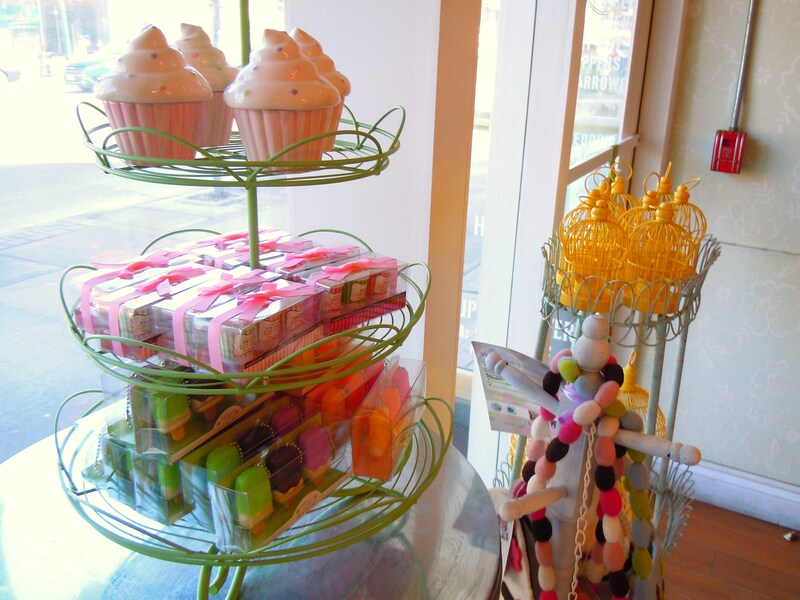 In addition to cupcakes, the shop sells baking accessories, cupcake themed items, stationery, and giftware. 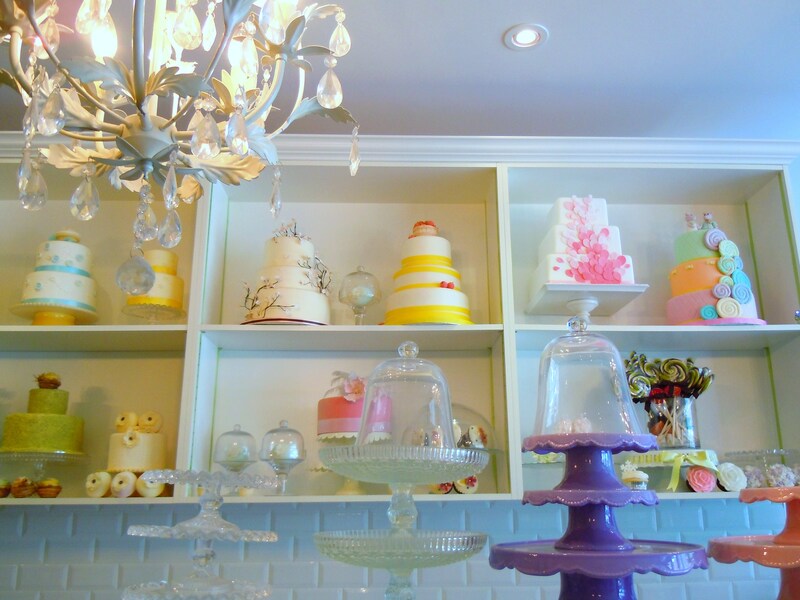 Spring colours and pastels are out in full force in Toronto’s cupcake bakeries! I haven’t been able to snag myself anything Easter related yet (I’m currently daydreaming about a chocolate cupcake with robin’s egg blue frosting and chocolate shavings), but I blame that on my “how many macarons can I eat in a day/week” fest a week and a half ago and sadly, I’m still thinking of when I can stage a redo so I can do it all over again. Hopping around town for macarons was more fun than I expected and for the first time ever, cupcakes were completely off the radar for the week. Macarons will definitely be making themselves more noticably present on the blog as the weeks and months go on, but they won’t ever eclipse cupcakes – cupcakes will be always be my greatest love! I’m slowly chipping away at Toronto’s cupcake scene but I have to say, even though it’s so much fun, it’s insanely difficult! 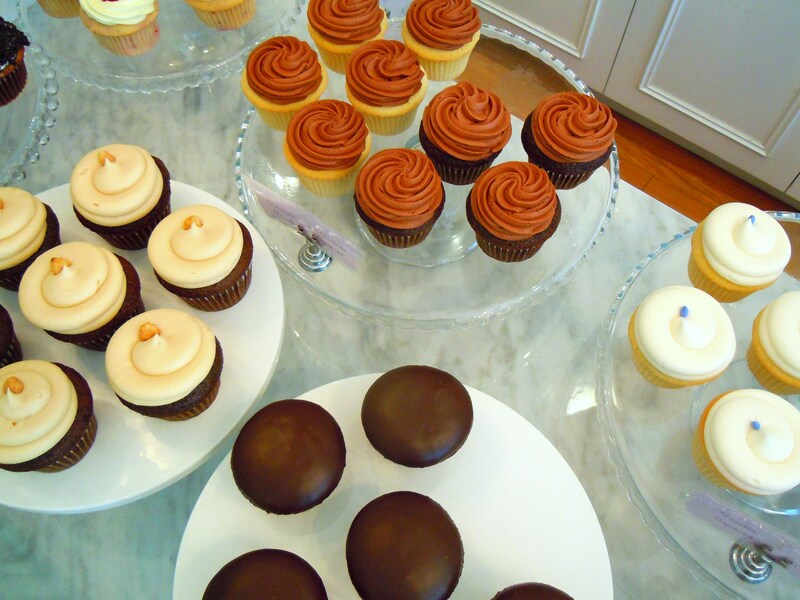 For every one new cupcake shop that I visit (new to me, not necessarily to the city), another one opens up! Either that, or I find out about an already-existing shop I never even knew existed! A new patisserie, Bo Bon, just opened up on Bathurst in North York and there are plenty of other shops on Queen East and in the west end that need my attention. 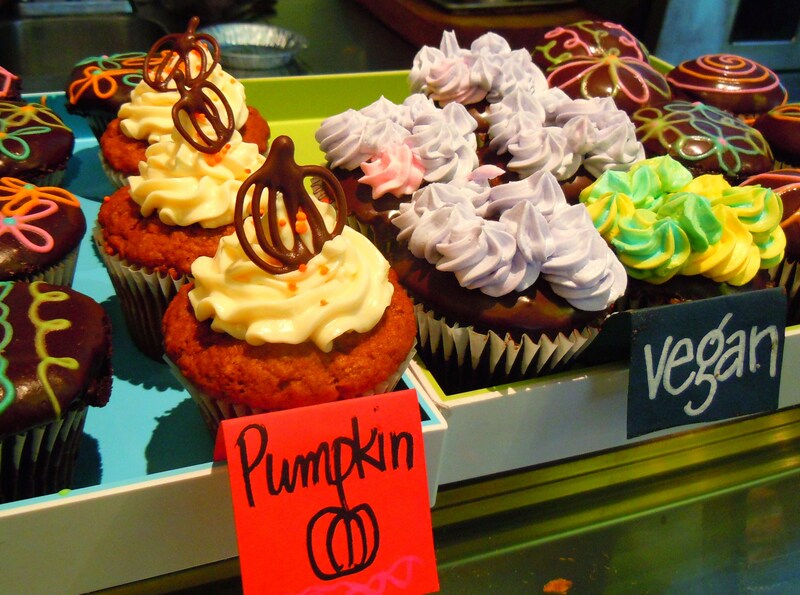 At least I can say with certainty that TO’s cupcake scene is far from boring! This month I spent a little more time in the Eglinton West neighbourhood and I came away from my walks with some exciting new food prospects and discoveries! Some patisseries, a jaw-dropping brunch menu from Hotel Gelato, a potentially fab sushi spot, a nice tea place, and so much more. Being in the neighbourhood obviously, for me, meant a stop at Flour Studio as well! 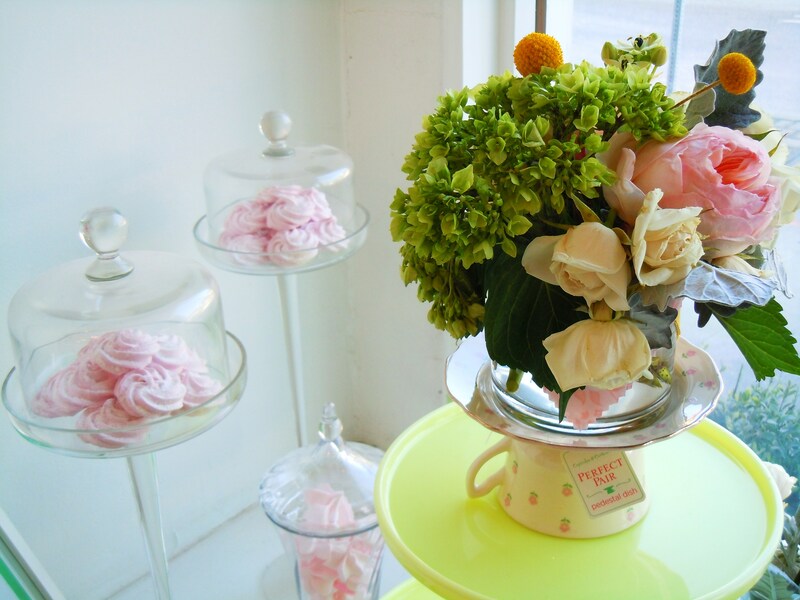 Flour Studio is one of my favourite spots not only for their soft and delicious cakes, but also for their giftware. I paid them a visit earlier this month to get some spring and Easter photos (and yes, a cupcake) and I was ecstastic to see brand new accessories and cupcake merchandise on their shelves. They had a rainbow of ceramic cake and cupcake stands in pastel shades, adorable decorative cupcake boxes (perfect for that single cupcake! ), beautifully decorated cupcake shaped sugar cookies (which you can see at the very top of the first photo), and to my utter delight, gorgeous little yellow bird cages! How cute would it be to house a little cupcake in it like a carrier?! Or even just as a decorative piece on the table for tea time or beside a vase of spring flowers. I hope you all enjoy the photos because there’s plenty more waiting in the wings. 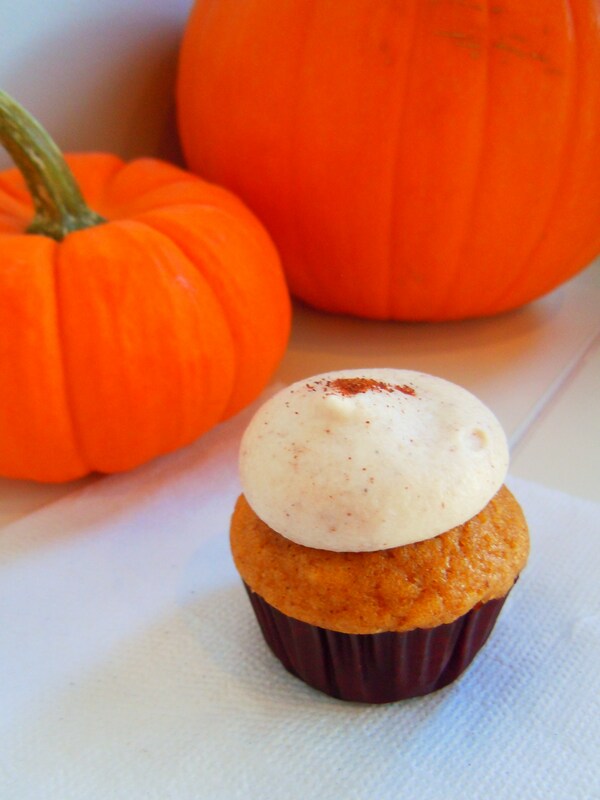 Tomorrow’s part II post will be celebrating one cupcake from Flour Studio in particular, one that contains a special cookie that just happens to be blowing out 100 candles this year! 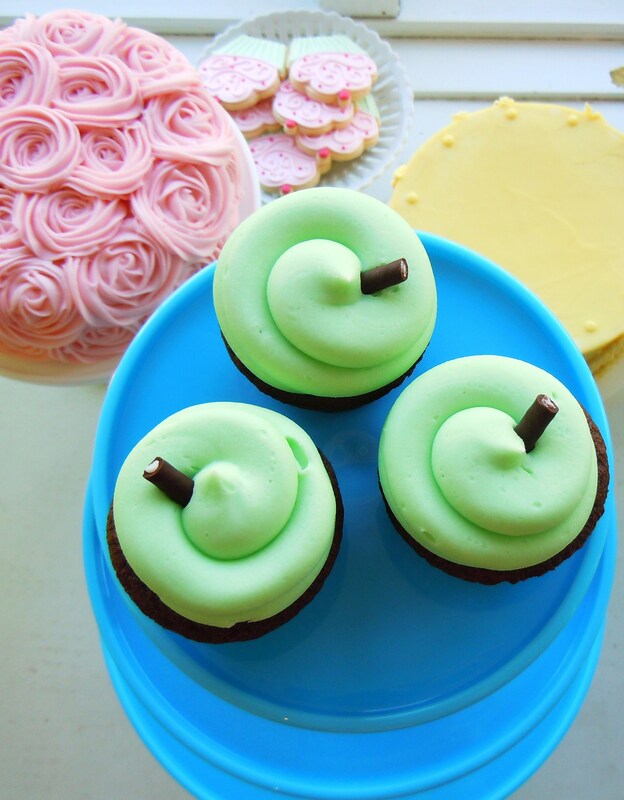 It’s a day to celebrate with cupcakes! Honestly though, I’m in the mood for cupcakes almost every day, not just my birthday 😀 Thank you so much for the sweet messages and birthday wishes, everyone, I feel so blessed and happy and all sorts of lucky. I’ve been celebrating all week, getting together with friends, spending time with my boyfriend, with my family, getting a little retail therapy in, and of course, eating lots of great food! 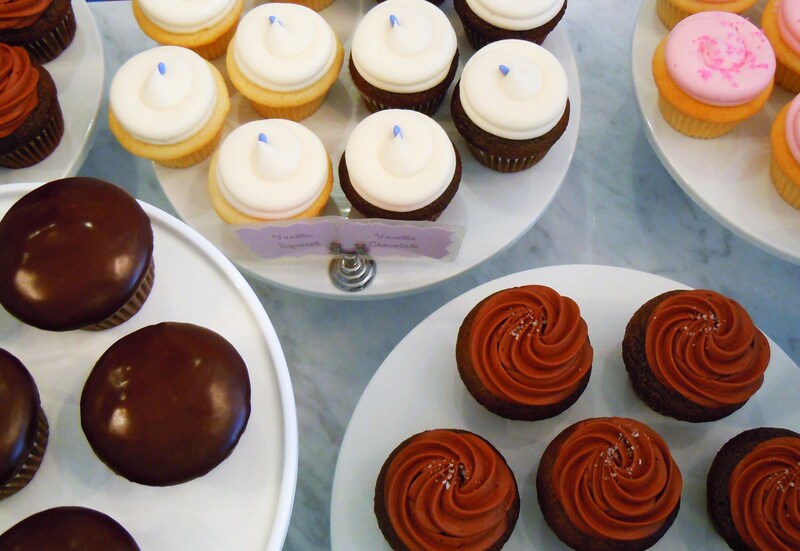 Even though today is my cake and candles day (as my friend Jen loves to say), I’m a little embarrassed to admit that I’ve eaten 3 cupcakes over the past week. 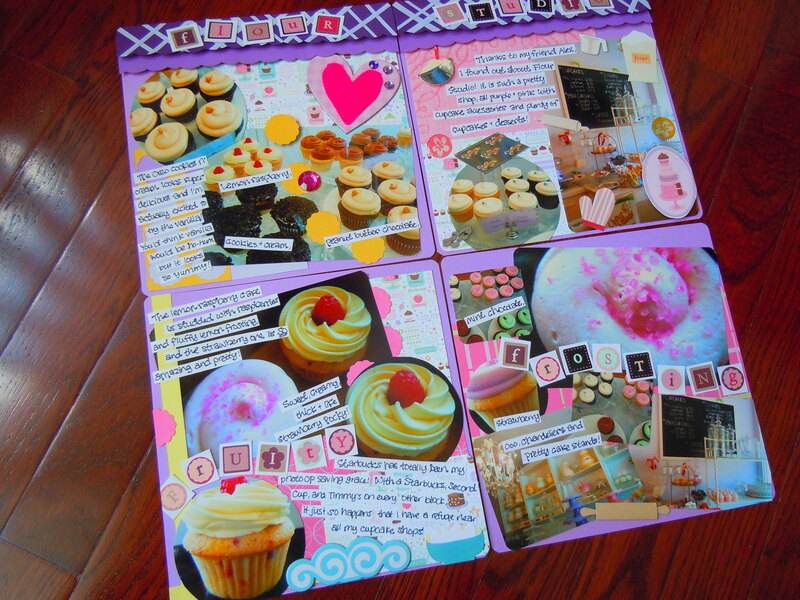 Forget having a cupcake-filled DAY, I’ve had myself an awesome cupcake-filled WEEK! 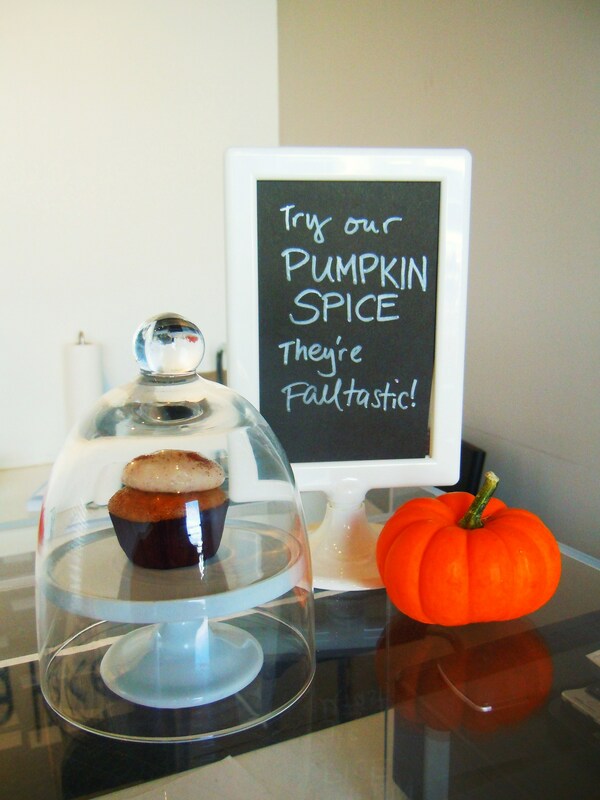 And to cap it all off, here’s part II of my two-part post on Flour Studio, the beautiful cupcakery located at 883 Eglinton Ave. West. I hope you all enjoyed the teaser photos I posted yesterday in Part I because there’s plenty more where those came from! Flour Studio is, in a word, pretty. If you like purple (like me! ), Flour Studio will make your heart flutter with its pale lilac, scalloped edge storefront awning, purple cupcake labels, and pale purple painted walls. It appeals to the giddy fairy princess in me with its chandeliers, bright pastel coloured cake stands, and cupcake accessories and trinkets. They have shelves of cards, stationery, and baking accessories along one of the walls, and a shelf of glassware on another. 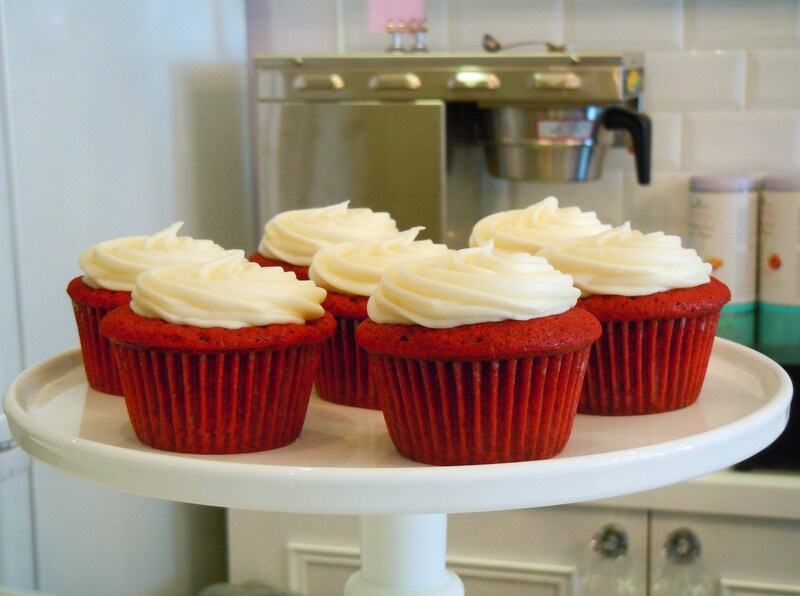 Flour Studio is a cupcakery that functions as part gift shop and part dessert cafe, offering a selection of cookies, tarts, and other desserts alongside their famous perfectly-frosted cupcakes. 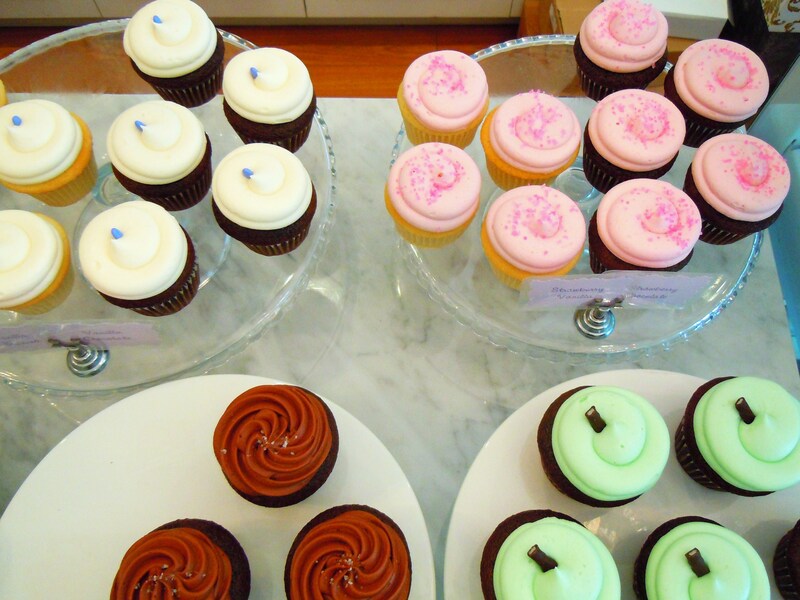 I just want to stare at their cupcakes all day long. 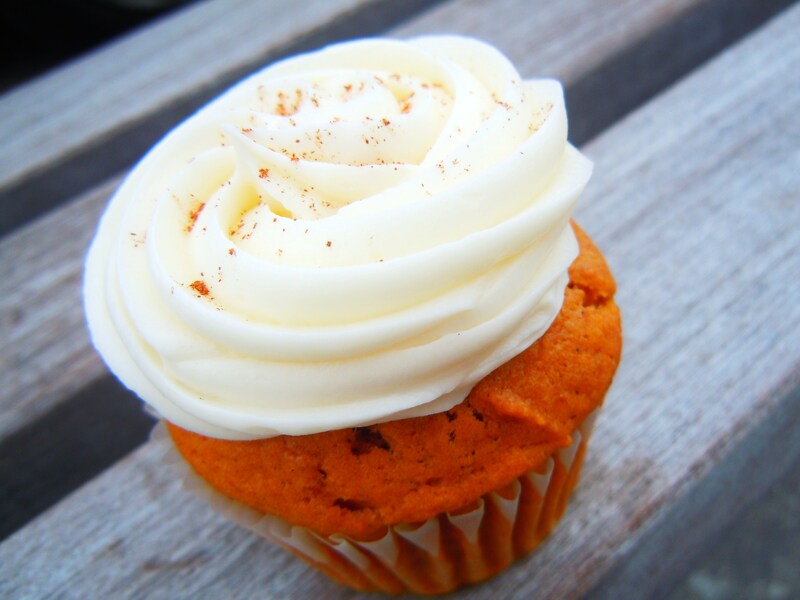 I have never seen cupcakes so perfectly frosted in this particular style. 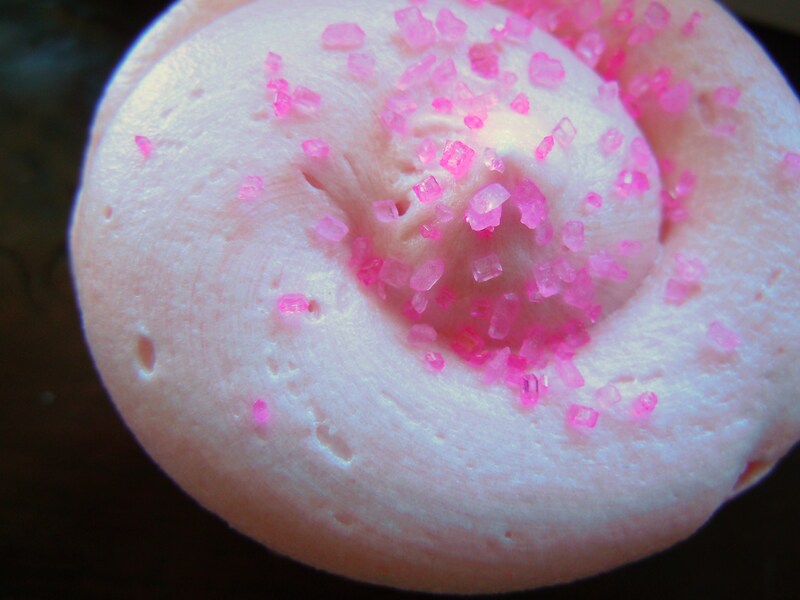 They remind me of adorable little frosting domes with its wide swirls, and the texture of it looks like a cross between airy cotton candy and marshmallow fluff! Since this was my first time visiting Flour Studio, I can’t report back with their entire menu of flavours just yet but on that day they had lemon raspberry, peanut butter chocolate (nut allergists beware, Flour Studio does use nut products in some of their sweets, so use your discretion and judgment when eating here and ask questions! ), vanilla on vanilla, vanilla on chocolate, double chocolate, dark chocolate fudge, Oreo cookies n’ cream, mint chocolate, and strawberry. 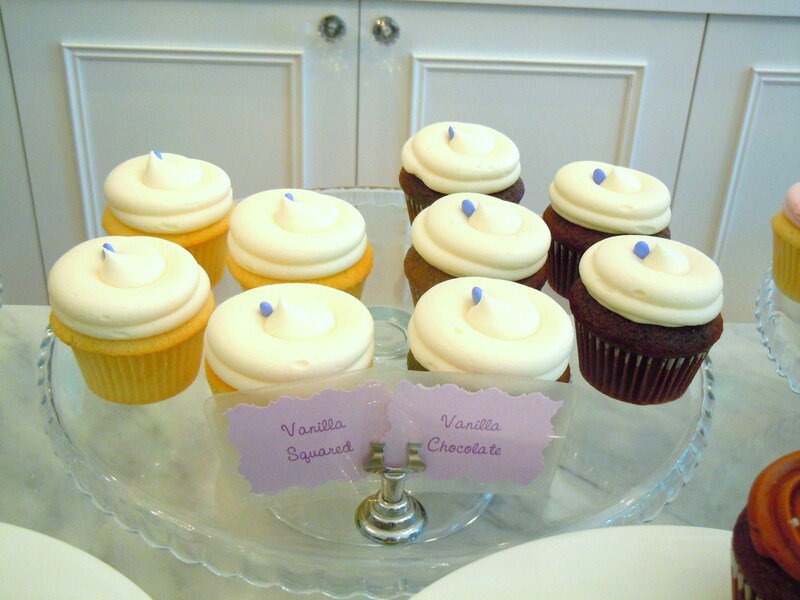 Their prices are very average in the context of cupcakeries in Toronto, ranging from $2.50 for classics (such as vanilla and chocolate varieties, for example) and $3 for other flavours. I’ll definitely get back to you all with another post outlining which flavours fall in particular price points, but for the time being, just know that their pricing operates the same way Dessert Lady in Yorkville does, on tiered system. A lemon raspberry cupcake along with a strawberry vanilla cupcake were lovingly packed away for me in a box with a pretty purple Flour Studio sticker and placed in an equally pretty Flour Studio paper shopping bag. I enjoyed my two cupcakes so much but for entirely different reasons. 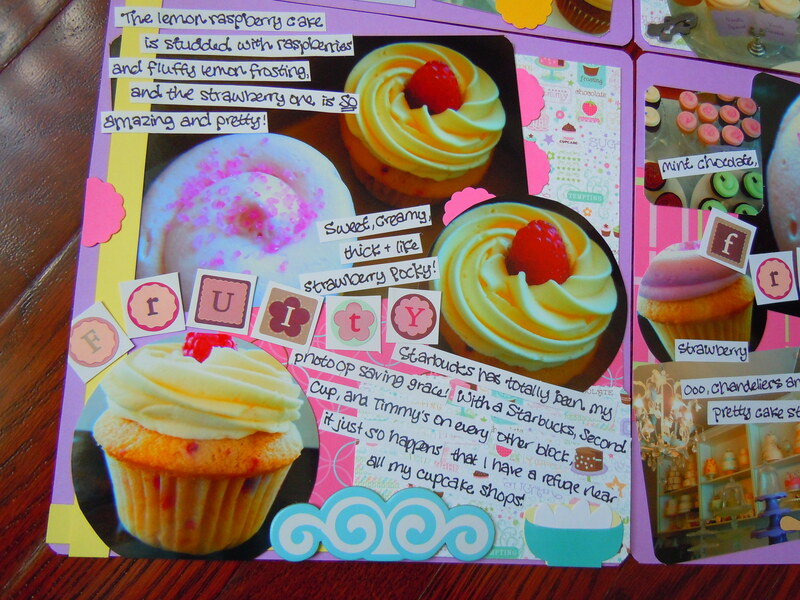 I love lemon cupcakes and desserts like nobody’s business (as I’ve reiterated ad nauseam, ha!) 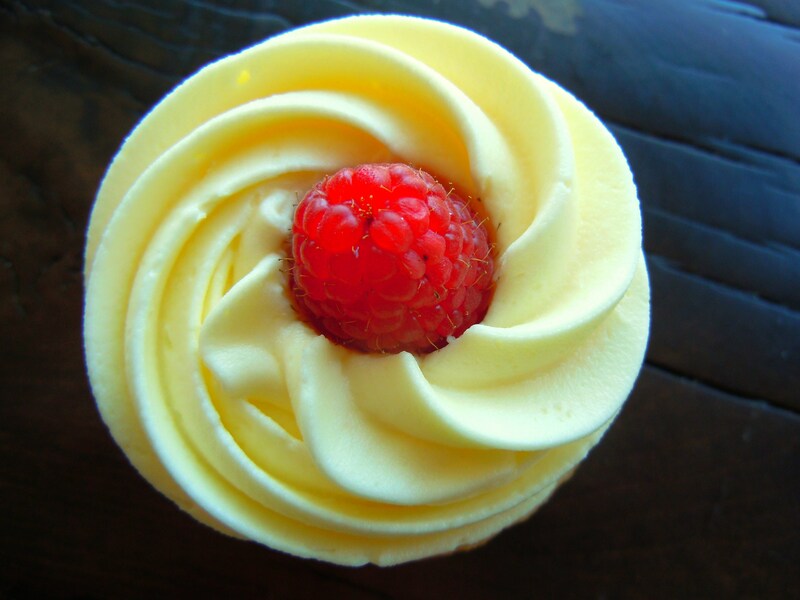 and the lemon raspberry cupcake had a sweet, creamy frosting with a light and fresh lemon flavour. Not an in-your-face sour lemon flavour, and not so much a sweet lemon sugar flavour, but more so an “airy” lemon flavour. Surprisingly enough though, it was the raspberry part of the cupcake that I thoroughly enjoyed! 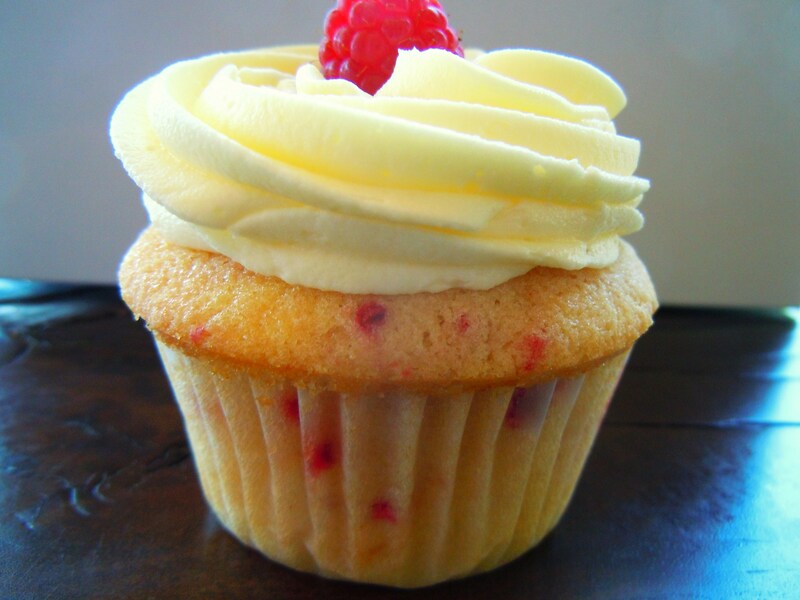 The cupcake was adorned with a fresh raspberry atop the frosting and the vanilla cake was studded with raspberries. 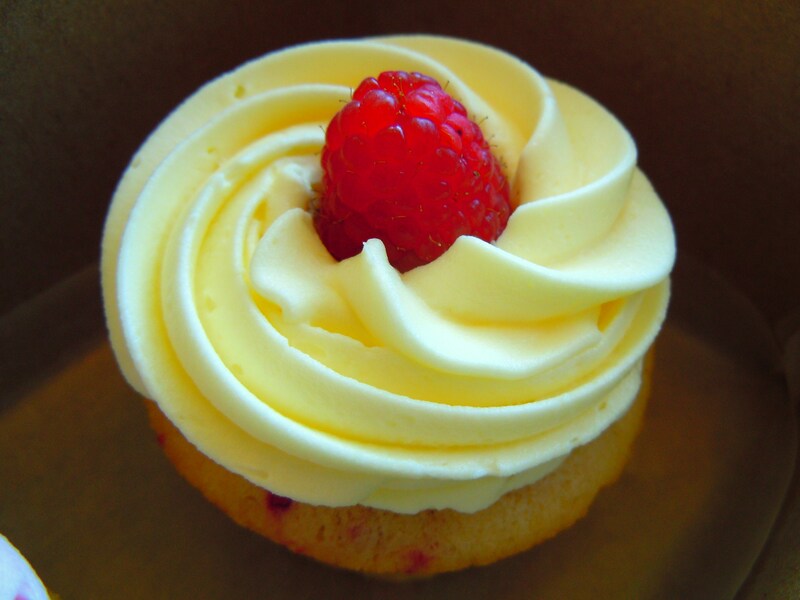 Thus far, I’ve never had a raspberry cake at any cupcakery (raspberry frosting, yes, but raspberry cake? Nope! 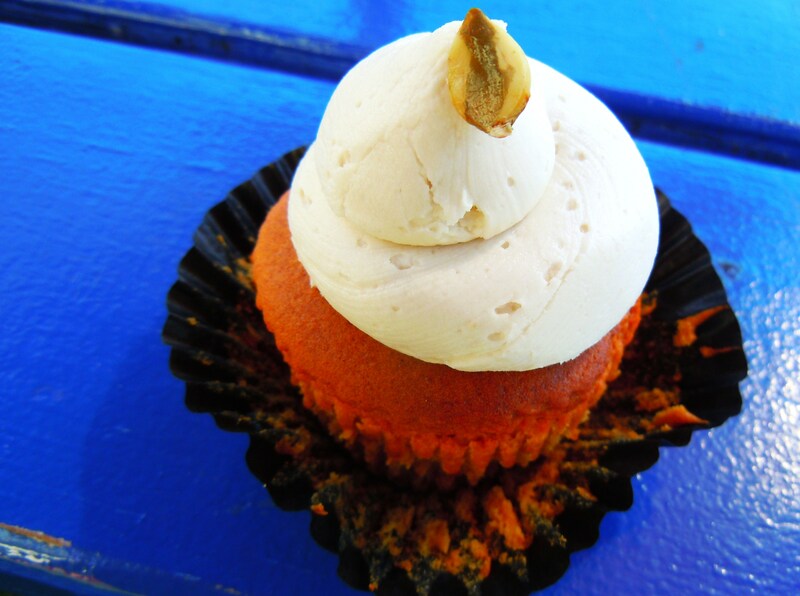 )and this cupcake turned out to be a tangy and fruity morsel of yummy cake. Onto my strawberry vanilla cupcake. 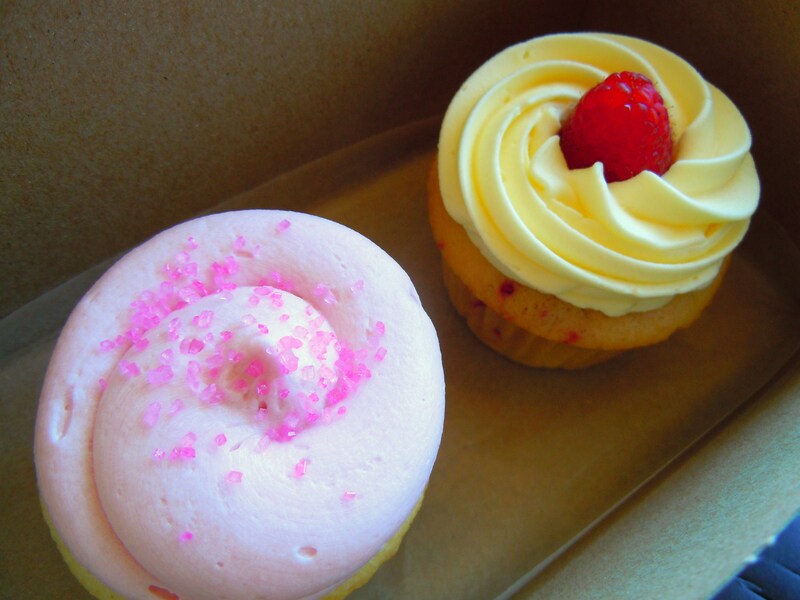 It’s really weird, but I’ve noticed that I rarely eat strawberry cupcakes. Given how I like strawberries, this black hole in my cupcake nom-noming is a head-scratcher. I kept this in mind as I chose my 2nd cupcake and I am so happy I did. It made me want to prance around in a ballerina tutu in a happy daze! Just look at it. It’s a thing of beauty. I mean, yes, Flour Studio’s cupcakes are gorgeous, but this strawberry one is so darn cute and girly and pretty and it was SO delicious. I look at it now and I want to hug and squish it because of its cuteness. 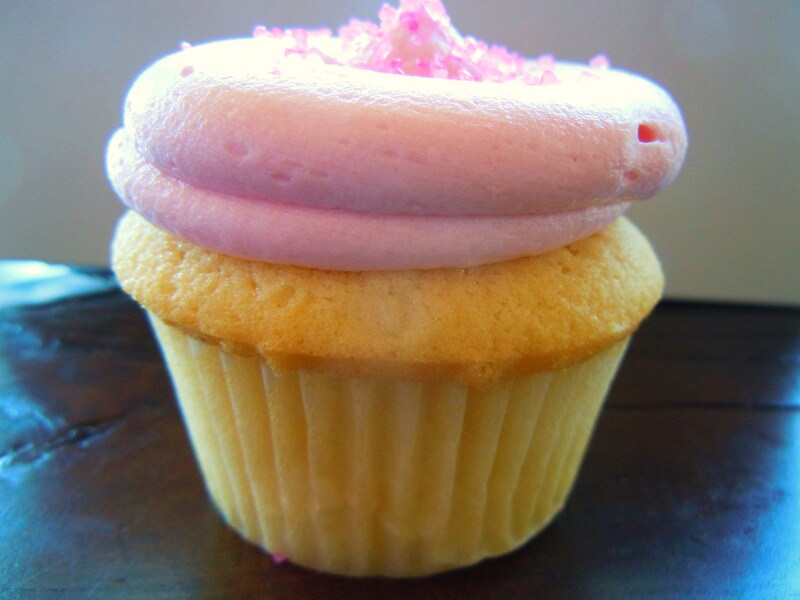 It’s like the embodiment of Pokemon’s Jigglypuff but in cupcake form. 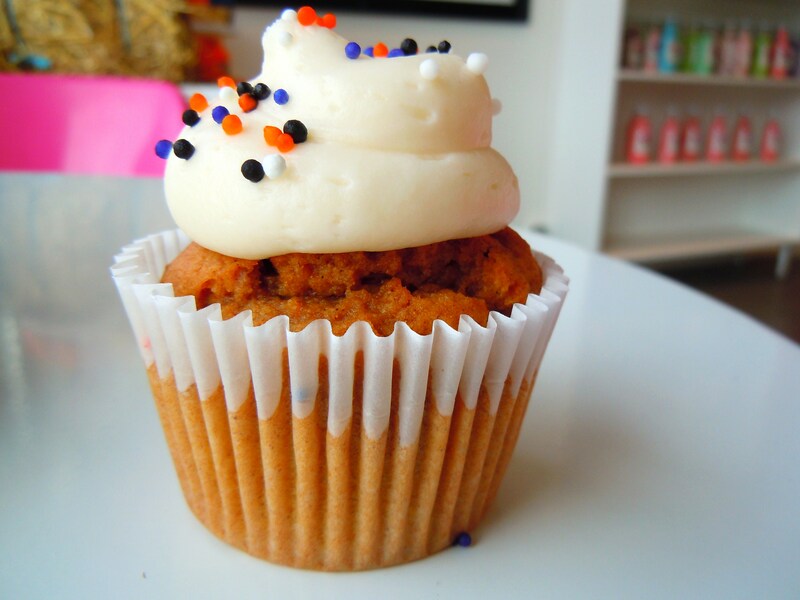 For this cupcake, the frosting does the talking. 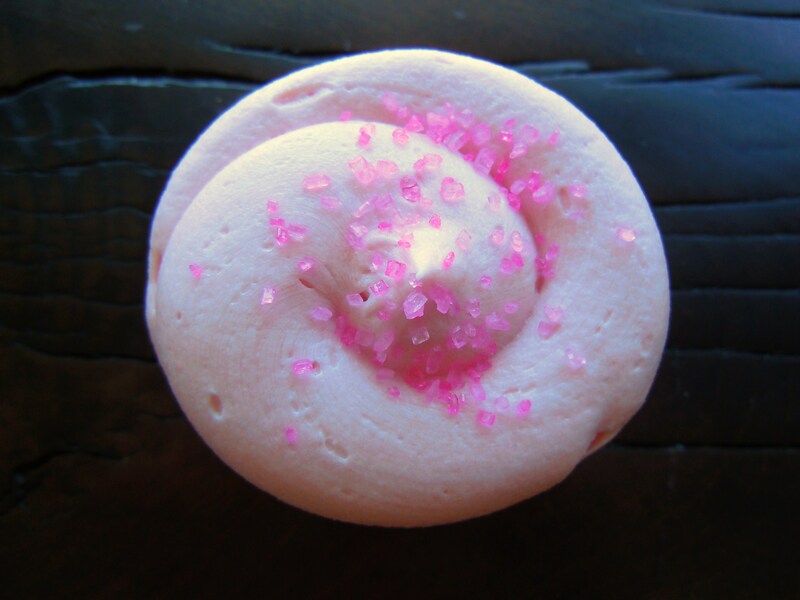 The strawberry frosting is so creamy and so fluffy and it has that perfect sugary taste that makes me think of cotton candy melting in your mouth. Oh, and imagine strawberry Pocky. 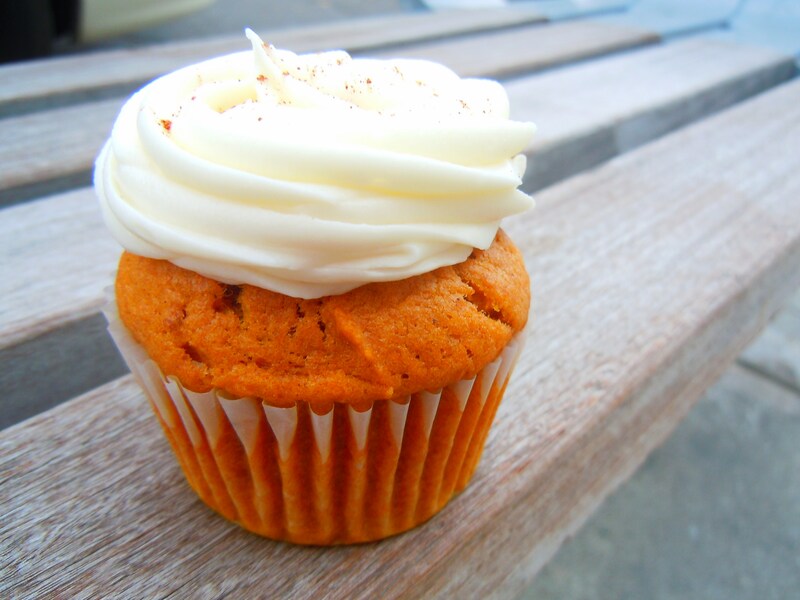 That’s what this strawberry cupcake tastes like, only better! After visiting a number of cupcake shops in Toronto and realizing just how many there are in and around the city, I liken my cupcake shop touring in Toronto (and beyond) to my sushi eating, in the sense that cupcake bake shops boil down to 3 things: identity and branding, creativity, and interpretation. It’s one of the reasons why I still get excited about trying vanilla cupcakes at different shops. 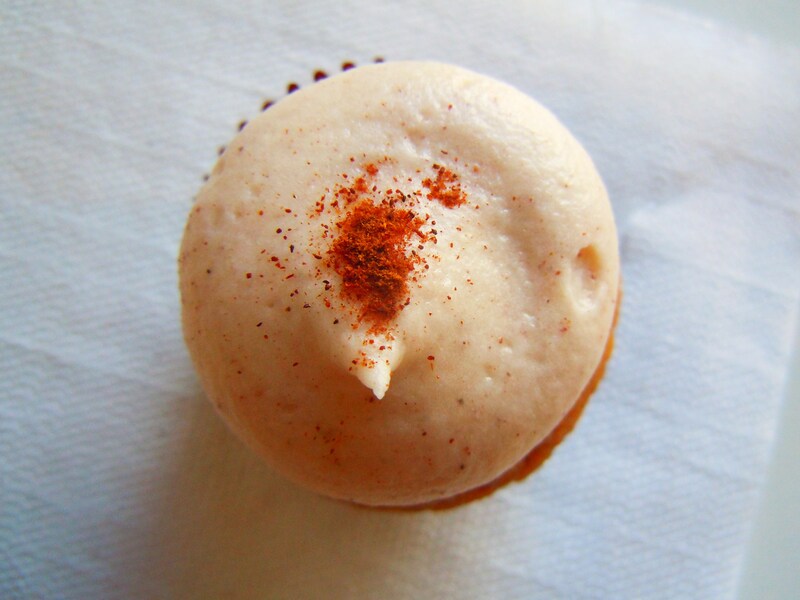 Sure, flavours like vanilla seem ho-hum in the grand scheme of things, but it’s because each one will interpret the design of the cupcake and execution of flavour differently that makes things interesting and so much fun. Flour Studio is a beautiful shop with very sweet people and great cupcakes I’d come back for in a heartbeat. Flour Studio is located at 883 Eglinton Ave. West, west of Bathurst St. They are closed on Mondays and Tuesdays (appointments are exceptional), and are open from 10am-6pm Wednesday-Saturday and from 1oam-3pm on Sundays. Scrapbook materials used: lavender, grape, and eggplant purple cardstock (Recollections); bubblegum pink, buttercup yellow, and pale yellow cardstock (Recollections); sweets and desserts patterned cardstock (The Sweet Stack by DCWV); alphabet stickers (Make It Special Crafts); baking embellishments (Jolee’s Boutique and Recollections); magenta felt; purple adhesive gems; medium scallop circle paper punch (ek success); black felt tip Sharpie marker. Here’s a riddle for you all: what’s purple, pink, and white all over with cupcakes so perfectly and adorably frosted they make your heart palpitate? Answer: Flour Studio on Eglinton West! 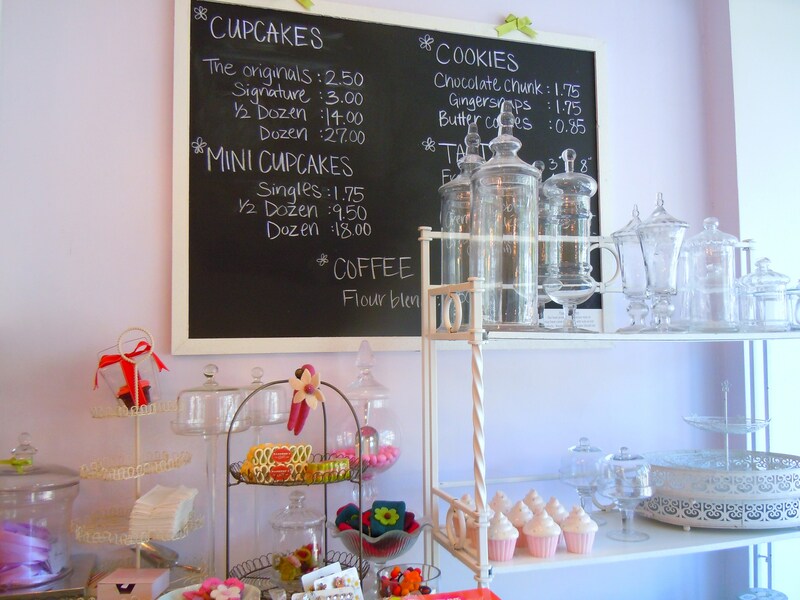 The cupcakery tour continues on with yet another beautiful shop with delicious cupcakes, sweet treats, and – wait for this- cupcake trinkets! 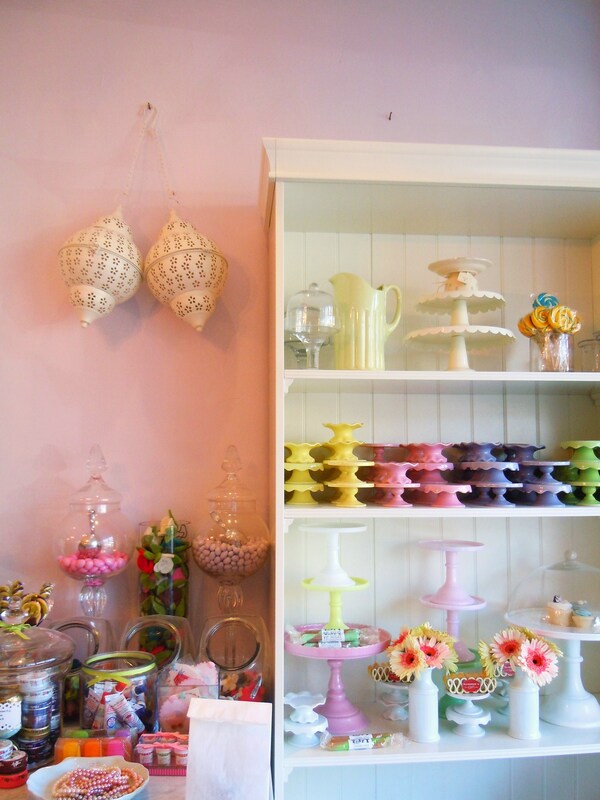 Now, I know full well that Flour Studio isn’t the only cupcake shop in the city that resembles a heavenly fairy land fraught with cupcake paraphernalia so cute you want to hyperventilate, but it makes me giddy just the same. 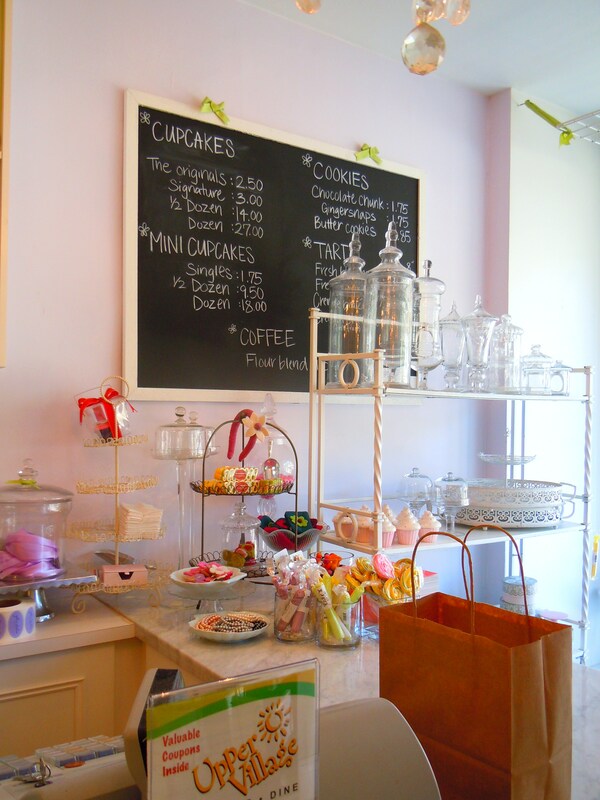 I’ve come across so many achingly cute and pretty cupcake and gift shops in Toronto over the years, with cupcake-related things up the wazoo! There are bake shops with an exclusive focus on cupcake desserts, places like Cards and Presents on Queen West and Blue Banana in Kensington Market that offer cupcake-related items, and shops such as Flour Studio and Lollicakes on Mount Pleasant (blog post forthcoming) which kind of fuse the two together, offering a very unique eating and shopping experience. Think delicious cupcakes alongside any or all of the following: cupcake jewelry boxes, stationery and notepads, lip balms, decorative toppers, candles, dishes, teapots, teacups, coasters, aprons, and so much more. I can’t imagine EVER becoming bored or indifferent to cupcake touring because each shop has its own identity and its own special feel. The shop names, the flavours, the storefront awnings and window displays – it’s a never-ending exploration quest in the best way possible! 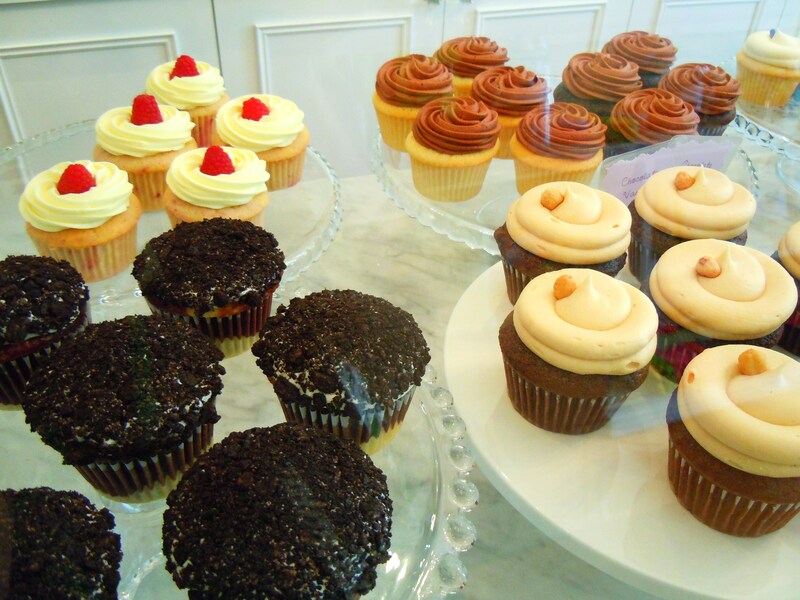 In my cupcake-loving world, these rank as some of my favourite places to shop and lose myself in. I have my friend Alex from Vivid Memories to thank for this happy visit to Flour Studio (and consequently, many more Flour Studio visits to come!) 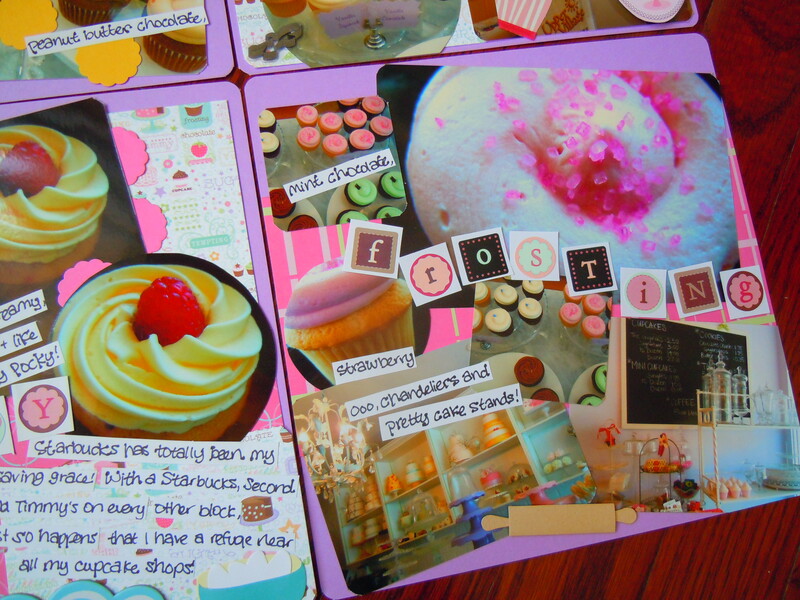 as I found out about Flour Studio from her blog and her personal cupcake tour. 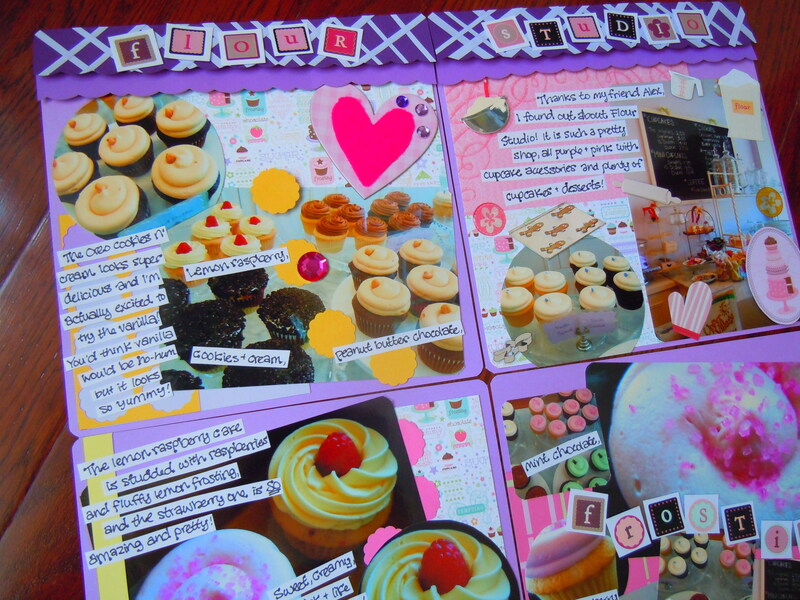 Here’s a sneak peek of tomorrow’s super sweet cupcake post, complete with a new scrapbook layout!